THR is reporting Guardians of the Galaxy star Dave Bautista will team up with Sylvester Stallone for Escape Plan 2, the sequel to the 2013 prison-break thriller. Steven C. Miller, who's helmed action thrillers such as Marauders and Extraction, is directing the project, which will now be a China-U.S. co-production via Beijing-based Leomus Pictures and Emmett/Furla/Oasis. Mark Canton is also among the producers. The pairing of Bautista and Stallone is in line with having two high-wattage action stars fight against, then team up with, each other. In the 2013 movie, Stallone, playing a prison-security specialist who finds himself in a near-impenetrable facility, partnered up with his 1980s action rival Arnold Schwarzenegger. Plot details are being kept in solitary confinement. The $20 million production is tunneling for a spring start in Atlanta. 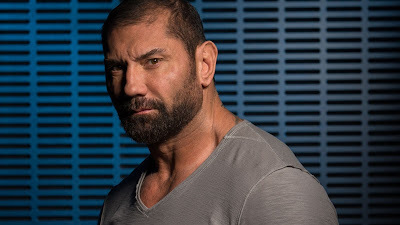 Bautista is a former MMA champion who segued into acting, slamming through to star status with a scene-stealing performance as Drax the Destroyer in Guardians. He reprises the role in Guardians of the Galaxy Vol. 2, which opens in May. He had a turn as a villain in James Bond movie Spectre and recently wrapped a role opposite Harrison Ford and Ryan Gosling in Blade Runner 2049. He is currently shooting Avengers: Infinity War and will then segue to Hotel Artemis, a sci-fi thriller with Jodie Foster.